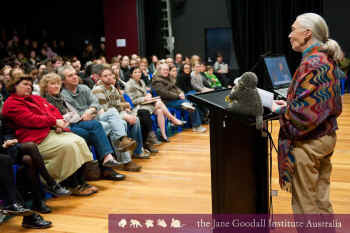 On the topic of our planet’s future, Jane Goodall, the legendary chimpanzee researcher, does not mince words: “How is it possible that the most intellectual creature that has ever walked on planet earth is destroying its only home?” Dr. Goodall, who is 81, spends 300 days year traveling the world in an effort to save it. The biggest problem, she says, is climate change. And the biggest culprit? Animal agriculture. In a lecture to hundreds of fans in NYC on April 15th, Dr. Goodall explained that agribusinesses are clearing rainforests in the Amazon to graze cattle and grow crops to feed them. 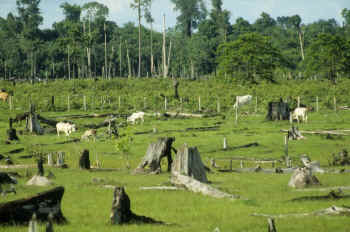 Without rainforests – the “lungs of the earth” – the planet’s ability to convert carbon dioxide (CO2), a greenhouse gas, into oxygen is compromised. Even more harmful than CO2, Goodall said, is the methane gas emitted in cow farts. As developing countries adopt Western diets heavy in animal protein, more methane and CO2 are released into the atmosphere, further warming the planet and jeopardizing our ability to inhabit it. Consume less. The more we buy, she argues, the more natural resources we extract from the planet. How much stuff do we really need? Improve the environment in our own communities. Goodall’s Roots & Shoots program, which has chapters in 130 countries, is helping people plant trees, clean rivers and perform other community services in their own backyards. At the end of her presentation, Dr. Goodall showed a video of a newly-released captive chimpanzee hugging her when he emerged from his crate and realized he was home in the jungle. Goodall uses this remarkable event to point out that, as intelligent as chimps are, their brains are far less powerful than those of humans. And she left the audience with a challenge — to harness the brainpower that we’ve used to damage the planet to save it.